I know I have been inundating you with new stamping plates and reviews, but today is all about getting back to basics. You know nothing makes me happier than flawlessly executed nail art! I wanted to create a blue mani that was matte with lots of pop and it came out exactly like I envisioned. 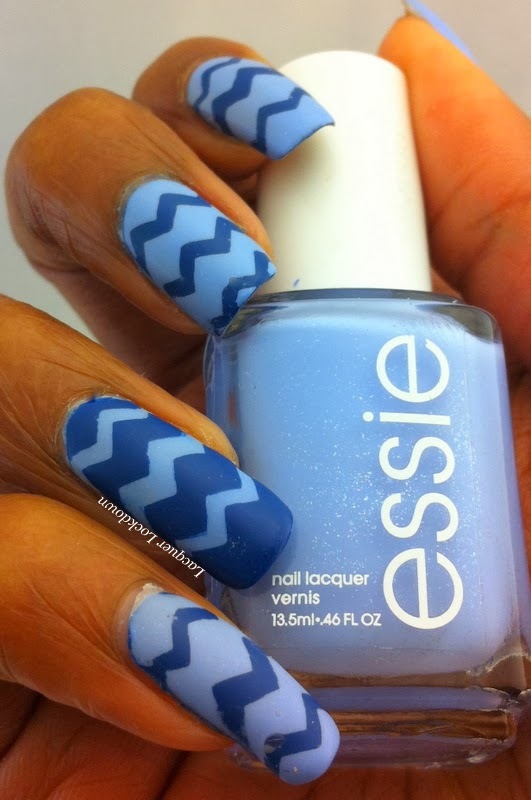 I enlisted the help of Nail Vinyls to create the yummy chevrons of my dreams and used Essie Bikini So Teeny and Mesmerize because I wanted something blue clean and refreshing. I also used Essie's Matte About You which to this day is still my favorite matte topcoat of all time! Check out the results below. So I discovered Nail Vinyls (hereforeto referred to as NVs) by @teismom on Instagram while stalking some of my favorite nail art bloggers. NVs are essentially the little sticker like things you use for french tip manis or if you take ring holders and cut them in half you can use to make half moon manis only 10,000 times better! When I first saw a IGer using them I was like I can just do the same thing with scotch tape or stamping. This is both wrong and right. 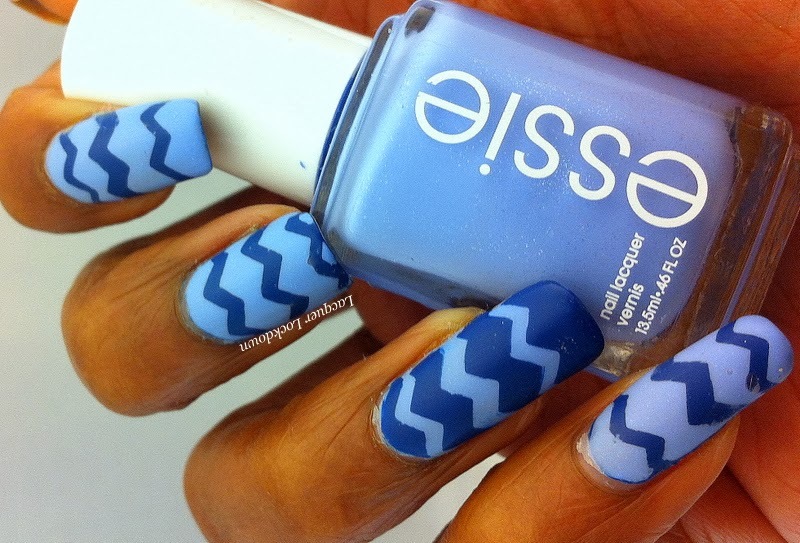 You can create cool chevrons with scotch tape but, unless you use craft scissorsn and even then, it is extremely difficult to create the exact same size of the chevron from nail to nail. This is also because you really only get one shot with tape as with the Nail Vinyls because afterwards they are covered in polish. With stamping you get the precision and consistency from nail to nail, but you have no ability to adjust the spacing of the design because the image is already etched into the plate so you get what you get. The NVs actually allow you to play with the spacing and gives you the reliability of creating consistently sized lines from nail to nail, clean up is easy, and you don't waste time cutting out pieces of oh so carefully measured tape so what's not to love? These little stickers come in a variety of shapes - lightening bolts, half moons, straight lines (my favorite), chevrons of varying sizes (also a favorite), french tip, and apparently there are more shapes in the works. I honestly felt skeptical about spending my money on these but after using them a few times I am so sold so I thought I'd share. Love the vinyls! Can i find them in México or just on the web?